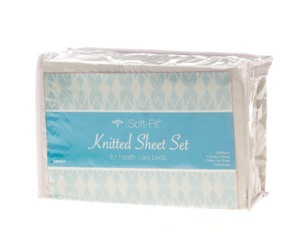 Soft-Fit knitted dealer pack sheet set includes contour sheet, 19 oz. ; fitted flat sheet, 14.6 oz. ; and and pillowcase, 3 oz.Made of 55% combed cotton / 45% polyester, these soft sheets provide maximum comfort and minimize the chance of skin breakdown. The cotton yarns are taken through a "combing" process to ensure that we use the strongest and finest yarns. Since these sheets are knitted instead of woven, they come out of the dryer virtually wrinkle-free with no need for ironing. Constructed with Spandex in the binding to provide an even better fit to the mattress. Fits twin size mattress. 1 set.